A suicide bomber attack a US base in eastern Afghanistan killing eight American civilians the biggest attack since October 2009. Four Canadian soldiers and a journalist in an attack in southern Afghanistan NATO said. Brietbart.com has the rest of the story. On Tuesday President Obama admitted human and systemic failure of American intelligence and Security regarding the failed attempted bombing of Delta flight 253 on Christmas Day. In a statement the President admits that the CIA had information that should have cause “red flags” and may have prevented attempted terrorist attack. The spokesman for the administration on condition of anonymity said the conversations were in code but the intelligence industry believes in that Al Qaeda messages intercepted were talking about Addulmutallab and the Detroit attack. The sources told the AP the reason that the President spoke out again on Tuesday because of new information. The Lone Star State of Texas is the shining star population and economic growth. A report from the US Census bureau has found Texas and Wyoming has were the states that grew in the year that ended July 1st, 2009. More people move to Texas than any other state. While Wyoming is its growth in percentage of population. CNN Money has the rest of the story. ABC News has obtain picture of the underwear bomb of Umar Farouk Abdulmutallab the 23-year-old Nigerian who wearing explosive device on Northwest/Delta Flight 253 Ansterdam to Detroit on Christmas Day. The underwear had a packet of PETN explosives sown in the crotch. 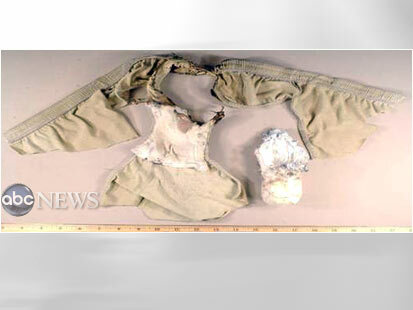 The bombers underwear sans bomb. 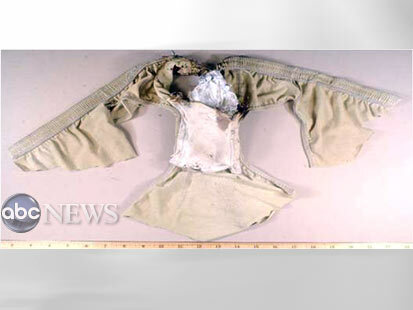 The second picture shows the underwear with the bomb on the side. The six-inch long package filled the explosive of PETN weighing 80 grams about a half- cup amount. A US government test of PETN found that 50 grams would put a hole in fuselage of a jet. The 50 grams amount of PETN was the amount of Richard Reid aka the shoe bomber over Christmas 2000. The 80 grams found on Abdulmutallab was one and a half times powerful than the shoe bomber. Al-Qadea in Arabian Peninsula claims responsibility for the attempted bombing of Delta Flight 253 on Christmas Day. The attack was in response series of raid in December at n Al-Qadea camp. US monitor messages via SITE Intelligence a website that keeps aware of Al-Qadea doings. On Monday Al-Qadea acknowledges that the website posting had a “technical fault”; which means the site gives bad instructions to bomber Umar Farouk Abdulmutallab that causes the bomb not go off. The website message has a picture of Abdulmutallab and statement said “Nigerian brother” broke all security barriers for his operation, dispelling the “great myth” of American intelligence. The bomb materials including explosive PETN was developed by mujahedeen by Al Qaeda “manufacturing department,” the statement added. A second US Monitoring site IntelCenter confirmed the statement. The posting also calls for Muslims in Western Military to repent for their service and calls for them to kill all “Crusaders” by all means necessary. The Yemen Government said Yemen would not become a haven for Al Aqeda like Afghanistan is. “Yemen is a land of peace and security, and will never be a refuge for these terrorist murderers and drug traffickers,” the defence ministry newspaper quoted a senior security official as saying. “Our mountains will never be a new Tora Bora for them,” the official added, referring to the Afghan hideout where US-backed Afghan opposition forces came close to capturing or killing Al-Qaeda leader Osama bin Laden in December 2001. “We will hunt them down until we have rooted out their terrorism and cleansed Yemeni soil of their satanic crimes,” the newspaper’s 26Sep.net. quoted the official as saying. Breitbart News has the rest of the story. Homeland Security Chief Janet Napolitano needs take an indefinite leave of absence or resign her post after Friday attempted bombing of Delta Flight 253 on Christmas Day. On Sunday Napolitano claimed that the system worked. “Everything went according to clockwork.” said Secretary Napolitano on FOX News. Brietbart has the video of correction. “The comment is being taken out of context.” said Homeland Security Chief Janet Nopalitano on NBC Today Show. Arizona can someone tell me How this woman go elected to Governor of Arizona and Homeland Security Chief. This woman’s incompetence is breathtaking. I thought Janet Reno was bad this is so much worse. Iranian Police attack protester on Saturday in Tehran. The protest on comes on police prepare for a series demonstrations to Iran’s leaders during religious festival and mourning a Shiite cleric an opposition website said. The website Rah-e-Sabz site says that Iranian police including The Revolutionary Guard and the Basijis a paramilitary force in Iran sprayed the demonstrators with tear gas and pepper spray trying force them disperse. The protest comes on the first ten days of the Moharram a time mourning for a beloved Shiite saint. Also Iranian protesters are mourning an opposition leader the Grand Ayatollah Hossien Ali Montazei who died Sunday. Sources say more protest on the way. AP via My Way News has more.